We can safely say that Unity3D has made game development easier for a lot of people. Something where it still has a long way to go is, with no doubt, shader coding. Often surrounded by mystery, a shader is a program specifically made to run on a GPU. It is, ultimately, what draws the triangles of your 3D models. Learning how to code shaders is essential if you want to give a special look to your game. Unity3D also uses them for postprocessing, making them essential for 2D games as well. This series of posts will gently introduce you to shader coding, and is oriented to developers with little to no knowledge about shaders. Models cannot be rendered without a material. 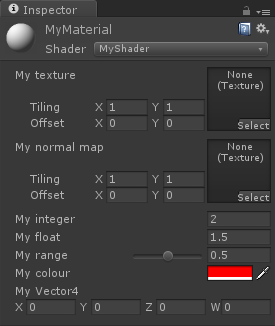 Materials are wrappers which contain a shader and the values for its properties. Hence, difference materials can share the same shader, feeding it with different data. You can have multiple SubShader sections, one after the other. They contain the actual instructions for the GPU. Unity3D will try to execute them in order, until it finds one that is compatible with your graphics card. This is useful when coding for different platforms, since you can fit different versions of the same shader in a single file. The type 2D, used in lines 3-4, indicates that the parameters are textures. They can be initialised to white, black or gray. 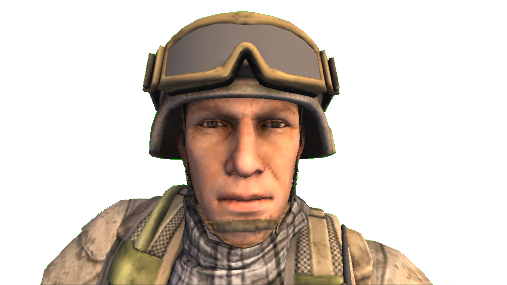 You can also use bump to indicate that the texture will be used as a normal map. In this case, it is automatically initialised to the colour #808080, which is used to represent no bump at all. Vectors and Colors always have four elements (XYZW and RGBA, respectively). The image on the left shows how these properties appear in the inspector, once the shader is attached to a material. Unfortunately, this is not enough to use our properties. The section Properties, in fact is used by Unity3D to give access from the inspector to the hidden variables within a shader. These variables still need to be defined in the actual body of the shader, which is contained in the SubShader section. The type used for texture is sampler2D. Vectors are float4 and colours are generally half4 which use 32 and 16 bits, respectively. The language used to write shaders, Cg / HLSL, is very pedantic: the name of the parameters must match exactly with the one previously defined. The types, however, don’t need to: you won’t get any error for declaring _MyRange as half, instead of float. Something rather confusing is the fact that if you can define a property of type Vector, which is linked to a float2 variable; the extra two values will be ignored by Unity3D. Lines 8-11 contain the actual Cg code; the section is signalled by the CGPROGRAM and ENDCG directives. Line 3, before the actual body, introduces the concept of tags. Tags are a way of telling Unity3D certain properties of the shader we are writing. For instance, the order in which it should be rendered ( Queue) and how it should be rendered ( RenderType). Unity3D also allows to specify relative orders, such as Background+2, which indicates a queue value of 1002. Messing up with Queue can generate nasty situations in which an object is always drawn, even when it should be covered by other models. It is important to remember, however, that an object from Transparent doesn’t necessarily always appear above an object from Geometry. The GPU, by default, performs a test called ZTest which stops hidden pixels from being drawn. To work, it uses an extra buffer with the same size of the screen its rendering to. Each pixel contains the depth (distance from the camera) of the object drawn in that pixel. If we are to write a pixel which is further away than the current depth, the pixel is discarded. The ZTest culls the pixels which are hidden by other objects, regardless the order in which they are drawn onto the screen. Line 5 inputs a texture, which is then set as the Albedo property of the material in line 12. The shader uses a Lambertian lighting model (line 3), which is a very typical way of modelling how light reflects onto an object. Shaders which only use the albedo property are typically called diffuse. Lines 15-17 converts the vertices from their native 3D space to their final 2D position on the screen. Unity3D introduces the UNITY_MATRIX_MVP to hide the maths behind it. 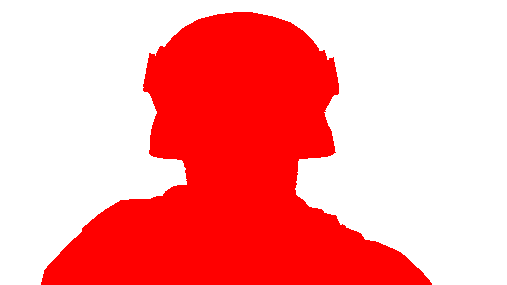 After this, line 22 gives a red colour to every pixel. Just remember that the Cg section of vertex and fragment shaders need to be enclosed in a Pass section. This is not the case for simple surface shaders, which will work with or without it. 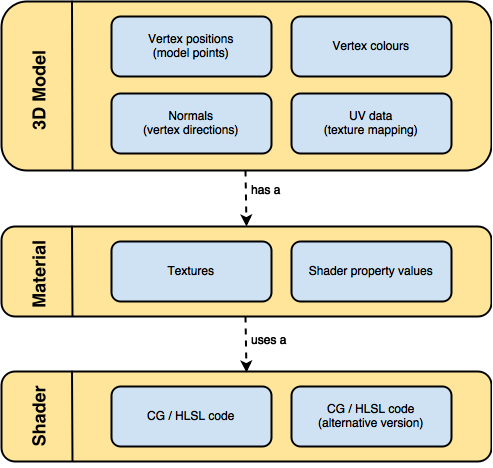 This post gently introduces the two types of shaders available in Unity3D and explains when to use one over the other. Four more posts will follow, explaining how to implement them in details. An extra post will introduce screen shaders, which are used for postprocessing 2D images. This is pretty much the same the documentation says, but to me it seems that this is only a partial truth. I’ve seen that even though the code within the CGPROGRAM section of a subshader obviously has an effect, what is set as Fallback, still makes a difference. Now, as Fallback (according to the documentation) essentially is the same thing as setting the subshaders from the fallback shader to be next, this means that even though subshader 1 is run, it also runs (at least partially) subshader 2. So, does this mean that the process of finding the the first compatible one is done separately for consequent render queues or something? Or am I understanding something else incorrectly here? Got here after reading your Unity 5 shader cook book.What a fantastic piece of knowledge and resource it is. Thank you so much for putting it out there. I’ll be making it required reading for my students. Got a mail id ? I have one request. Can you perhaps do a breakdown / tutorial on how to create a Matte shadow material ( also known as shadow catcher ). Packt does videos too. Hope you make a video series. >When rendering triangles, the GPU usually sort them according to their distance from the camera, so that the further ones are drawn first. This is typically enough to render solid geometries, but it often fails with transparent objects. Isn’t that the opposite? Try to render closer opaque geometry first (so you don’t run pixel shaders for things that end up hidden), but for transparent items, render further geometry first so that it alpha blends properly? Typically you do start from back to front (it’s called the painter’s algorithm). Depth testing takes care of not drawing pixels that are occluded. Thank you!!! super simple ! !